Following the assassination of Jaysh Khalid ibn al-Waleed's amir Abu Hashim al-Shami, the speculation of an inside job has given way to open infighting within the group. In terms of what has taken place on the ground, the security apparatus has arrested a number of figures within Jaysh Khalid ibn al-Waleed, most notably Ábu Obeida Qahtan, a Palestinian-Syrian jihadi veteran who had fought in Afghanistan and connected early on/from the outset with al-Khal, the original leader of Liwa Shuhada' al-Yarmouk that is presently the largest component of Jaysh Khalid ibn al-Waleed. Qahtan was an important source of financing from the beginning for Liwa Shuhada' al-Yarmouk, but contrary to this report in the pro-rebel outlet All4Syria, he did not come to Syria from Jordan in 2014 but was rather in Syria much earlier, even before the battles in early 2013 that culminated in the capture of the locality of Jamla near the border with the Golan Heights, from which Liwa Shuhada' al-Yarmouk originates. He took over the leadership of the group following al-Khal's assassination in mid-November 2015, but was then replaced by the Saudi Abu Abdullah al-Madani dispatched by the Islamic State in March 2016 on account of administrative failings. More recently, Qahtan notably survived an assassination attempt in August 2016 that wounded him. The incident was reported by the Islamic State's auxiliary news outlet Amaq News, as per below. Is it conceivable that these leaders are agents of Israel? Or is it the splitting of the ranks by the new persons in the area in addition to the members of Harakat al-Muthanna as they are playing on that? 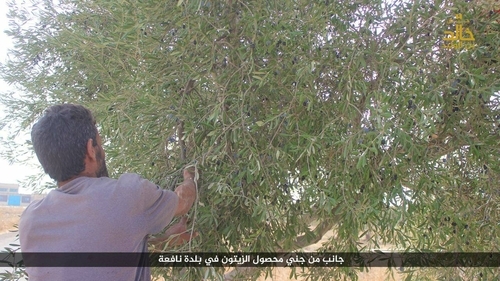 Harakat al-Muthanna gave a false bay'a [pledge of allegiance] to protect themselves after they implicated Liwa Shuhada' al-Yarmouk with the Free Army in the battle of Adwan, and what proves this talk is the fact that they entered the Hawdh in considerable numbers, and after several days they shaved their beards, took up sports clothes and fled like women. Even sometimes there are women more courageous than this gang under the leadership of Abu Ayyub al-Masalama, who sold everything to Liwa Shuhada' al-Yarmouk, even fuel, and smuggled the money outside, and did not give members of his movement a Syrian pound. And he went to the north on the pretext of giving allegiance to the Islamic State there. Accusing Abu Obeida Qahtan of treason is something that cannot be reasonably countenanced, because the man is among the most prominent of the jihadi leaders in the world. Nidal al-Baridi is the elder brother of al-Khal Abu Ali: any error in the Hawdh hangs on the rack of this person because he is more honourable than they are. Abu Abdo al-Askari and Abu Tahrir are men who have worked with all conscience and have not engaged in treachery for one day...So who is the agent? This elite from the men or gang of al-Muthanna and gang of the Deraa camp, along with those who came with them of new teeth." For more context on the post above, the battle of Adwan was an engagement in the failed offensive launched in March 2016 principally by Liwa Shuhada' al-Yarmouk with cooperation from Harakat al-Muthanna, which had at that point established itself in some localities just to the east of Liwa Shuhada' al-Yarmouk's holdings but by the end of the offensive had lost those holdings and had to retreat into Hawdh al-Yarmouk. During the battle of Adwan, the source says that "al-Muthanna demanded support from al-Shuhada'. al-Shuhada' heeded the call and sent a group of youth, and Adwan was liberated. al-Shuhada' asked al-Muthanna to evacuate the ammo present in Adwan to the Hawdh four times. They sent cars to carry the ammo and return empty during the night, and suddenly al-Hurr [the Free Army/FSA] seized Adwan and took all the weapons." Also of note is the figure of Nidal al-Baridi. 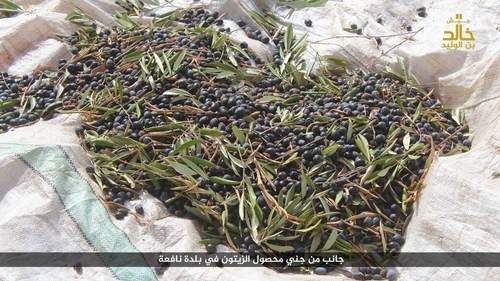 He has long been associated with smuggling operations in the area and actually clashed previously with elements in Liwa Shuhada' al-Yarmouk prior to the formation of Jaysh Khalid ibn al-Waleed, in particular with the Diwan al-Hisba that enforces Islamic morality as he was accused of drugs smuggling, apparently being punished with flogging and a fine. That internal strife may have been a reason behind the Islamic State's dispatch of Abu Abdullah al-Madani to head the group, but there is no evidence pace some claims at the time that Nidal al-Baridi had plans to sever Liwa Shuhada' al-Yarmouk's links with the Islamic State and declare affiliation with the FSA. Other accounts give a slightly larger list of names of people arrested recently including some more specific names of relatives of al-Khal and people of the Baridi clan, the key clan behind Liwa Shuhada' al-Yarmouk. 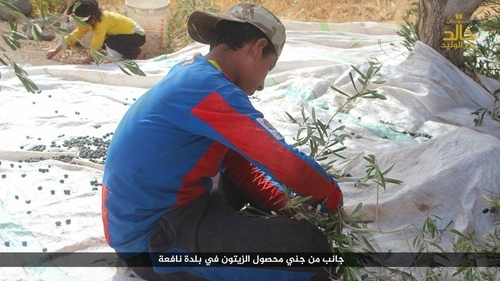 Despite this internal turmoil, the media office for Jaysh Khalid ibn al-Waleed is continuing to produce output, releasing a set of photos today concerning olive agriculture in the Hawdh al-Yarmouk locality of Nafi'a, as per the photos below. These photos have been circulated on Islamic State aggregate channels on Telegram like Nashir News. It would appear that the group's media line is endorsing the idea of cracking down on a supposed conspiracy orchestrated by people from the Liwa Shuhada' al-Yarmouk, with a Jaysh Khalid ibn al-Waleed media account under the name of 'Mohammed Daraa' writing a somewhat cryptic post on Facebook on the night of 27-28 October: "Indeed God does not love traitors." In sum, the most likely explanation for the internal conflict is that members of the Harakat al-Muthanna contingent within Jaysh Khalid ibn al-Waleed have seized on Abu Hashim al-Shami's assassination to undermine the influence of figures in the Liwa Shuhada' al-Yarmouk contingent, undoubtedly resenting the loss of the prior status and power they had enjoyed before being forced to take refuge in Hawdh al-Yarmouk (a matter I have touched upon previously). While some members of Harakat al-Muthanna quit the field all together, others may have tried to curry favour with the Islamic State, including through members heading up to formal Islamic State territories further north, in the hope of bolstering the positions of Harakat al-Muthanna members within Jaysh Khalid ibn al-Waleed. In this regard, it is certainly possible that the new amir for Jaysh Khalid ibn al-Waleed is close to the Harakat al-Muthanna contingent and is endorsing the crackdown on key figures in the Liwa Shuhada' al-Yarmouk contingent concentrated in Jamla. It may also be that the Islamic State is endorsing the crackdown, perhaps convinced of treachery on the part of the likes of Abu Obeida Qahtan. This is so despite suspicions of a Harakat al-Muthanna hand in the assassination of Abu Hashim al-Shami. The exact truth may be difficult to discern, but something has clearly been amiss in integrating Harakat al-Muthanna into Jaysh Khalid ibn al-Waleed. Despite these problems, it is not clear the rebel factions at war with Jaysh Khalid ibn al-Waleed are set to take advantage of this internal fighting and advance at the group's expense.